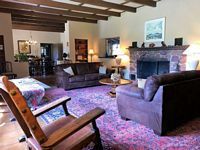 The Crown C Ranch is located in southeastern Arizona approximately 50 miles south of Tucson. The property is approximately 3 miles southwest of Sonoita on Highway 82 and is accessed via Crown C Ranch Road. 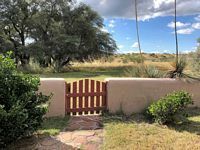 This property lies in the scenic Sonoita area. This beautiful region offers quiet rural living with a variety of outdoor activities such as hiking, birding and horse-back riding. The immediate area features numerous local vineyards and the Santa Cruz County Fairgrounds with its festivals and equine events throughout the year. Tucson, an easy 45 minutes away, offers major medical facilities, the University of Arizona, shopping, restaurants, an international airport and all of the other features of a major metropolitan area. The Crown C Ranch has a colorful history. 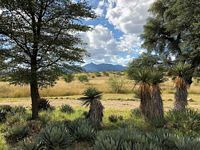 The property is the site of Camp Crittenden, a Cavalry post established in August 10, 1867 to protect settlements in the Babacomari, Sonoita and Santa Cruz Valleys. Lieutenant H. B. Cushing, leading troops from Camp Crittenden, was killed nearby in a skirmish with Apaches on May 5, 1871. The Camp was abandoned on June 1, 1873 after it was decided to move the troops to another post. The ruins of this Camp can still be seen in the southwest portion of the property. The Crown C Ranch was subsequently owned as portions of larger ranches by several different pioneer ranching families including the Vail and Boice families. Blake Carrington purchased the Crown C Ranch in the 1930’s. Mr. Carrington built the existing main home and other improvements shortly after he purchased the ranch. The current owners acquired the Crown C Ranch in the late 1970’s. Since that time the Crown C Ranch has been operated as a working cattle and guest ranch. The Ranch will graze approximately 280 cattle annually. The Forest Allotments are rated for 200 cattle annually. The remaining 80 head are grazed on the Deeded land and adjacent private grazing leases. Main House- A historic owner’s home of approximately 6,100 square foot. 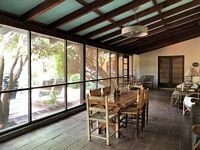 Constructed in 1937 out of native adobe block it has 9 bedrooms, 6 bathrooms, dining room, living room, guest wing, numerous sitting areas and three large screened porches. 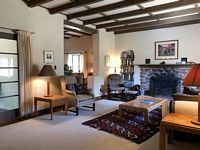 The architecture and layout are very unique and the home has been carefully maintained over the years. It is situated to maximize the beautiful views in several directions. Swimming Pool- Adjacent to the main house. Labor House- Approximately 1,600 square foot with 2 Bedrooms and 1 Bathroom. It was also constructed in 1937. 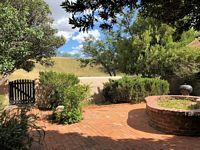 Adobe Barn- Beautifully constructed with exposed native adobe block, it consists of approximately 1,400 square feet with 2 tack rooms, 1 feed room and shop. Hay Barn- Approximately 600 square foot covered metal shed. Livestock Corrals- Situated in close proximity to the Adobe Barn. This area has a mild climate with Summer highs in the mid 90’s and Winter lows in the mid 30’s. Precipitation averages 15 inches per year. The elevation varies from 4,800 feet on the Deeded land to 8,400 feet above sea level on the Forest. The topography of the Deeded land consists of low rolling ridges with open valleys on a north to south alignment. The Forest Allotment is more mountainous. The vegetation is a Madrean Oak Grassland consisting of numerous native perennial grasses with scattered oak and mesquite trees. The Ranch has three wells ranging in depth from 140 to 225 feet. There is one dirt stock tank on the Deeded parcel. The Forest Allotments are well watered by springs, dirt stock tanks, a water pipeline and some seasonal live water. The Ranch has electricity provided by Sulphur Springs Valley Electric Cooperative. Telephone & internet service are available. Water is provided by private well. Sewer service is provided by septic tank. Propane is delivered by local providers. The property is zoned Santa Cruz County GR (General Rural). This zoning provides for low density residential and agricultural uses. Portions of the Deeded land and the adjacent surrounding properties are subject to deed restrictions that limit further subdivision to one house per fifty acres. There are additional restrictions on building design and type to protect the scenic beauty and rural nature of the area. 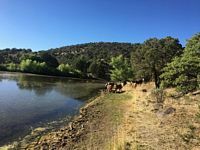 The Crown C Ranch is an exceptionally beautiful property that lends itself to several uses including: exclusive guest ranch operation, corporate/religious retreat or a very secluded private hideaway. The scenic beauty of this property, its privacy from today’s busy world and the unique historic buildings combine to create a one of a kind opportunity. This property is one of the last large land parcels available in the immediate Sonoita area. The surrounding properties have been carefully deed restricted to insure that future development is tasteful and in harmony with the landscape and adjoining properties. 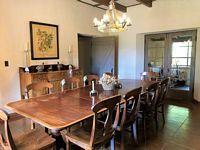 This is a unique opportunity to acquire a beautiful property that enjoys a very quiet rural lifestyle within close proximity of Tucson. There is an additional 133 acres adjacent to the north boundary of the Deeded land that is available for purchase from a separate owner. This property would make a nice addition to the Crown C Ranch. Please click here to download (about 9MB) a printable brochure in Adobe Acrobat format. If you get frustrated trying to make this work on your computer, don't hesitate to ask us to mail you a printed and bound brochure instead. Adjacent 133 acre tract - $795,000, also being handled by Walter Lane.